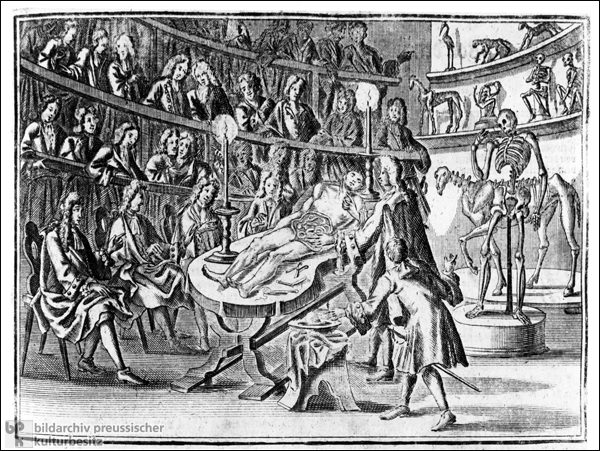 This illustration shows an anatomist dissecting a corpse before students in a medical theater. The study of anatomy dates back to antiquity and made great gains during the Renaissance, thanks to the work of Andreas Vesalius. Knowledge of the human anatomy became indispensable not only for physicians but also for visual artists. Before the Enlightenment, dissections were performed almost exclusively on corpses of criminals and people who had committed suicide, and this gave the procedure a punitive air. Copperplate engraving by an unknown artist published in the 1750 edition of Franz Philipp Florinus, Oeconomus prudens et legalis. Oder Der kluge und rechtsverständige Haus-Vater [Oeconomus prudens et legalis. Or the Generally Prudent and Judicious Housemaster].